I am calling the one “Wind Tomorrow” since I have heard that saying about “red sky at night; sailor’s delight…” meaning there will be wind for the sails the next day…The other is the river at sundown in early December and you can probably figure out there is going to be some sort of storm from the looks of the sky.. I wanted to do something with a good rural feeling to it for the Custer County Art and Heritage Center auction in MT that takes place the latter part of September. It’s a fund raiser for the center so I am hoping these will bring them a good chunk of change for their cause. They have one of the nicest art centers around and they do tons of great things for education of youth, etc. Something to note…some of the heavy pastel papers like Wallis and Art Spectrum and Pastelbord to name a few let you rework paintings. If you hate them and you haven’t totally destroyed your surface with fixatives, you can often brush, wipe and wash off the surface and repaint it. It’s a good solution to last weeks “hissy fit” of being so disgusted with the piece you pitch it in the garbage can. Some times it’s probably best to do that and just take your loss, but other times it can be salvaged and reworked into something good. 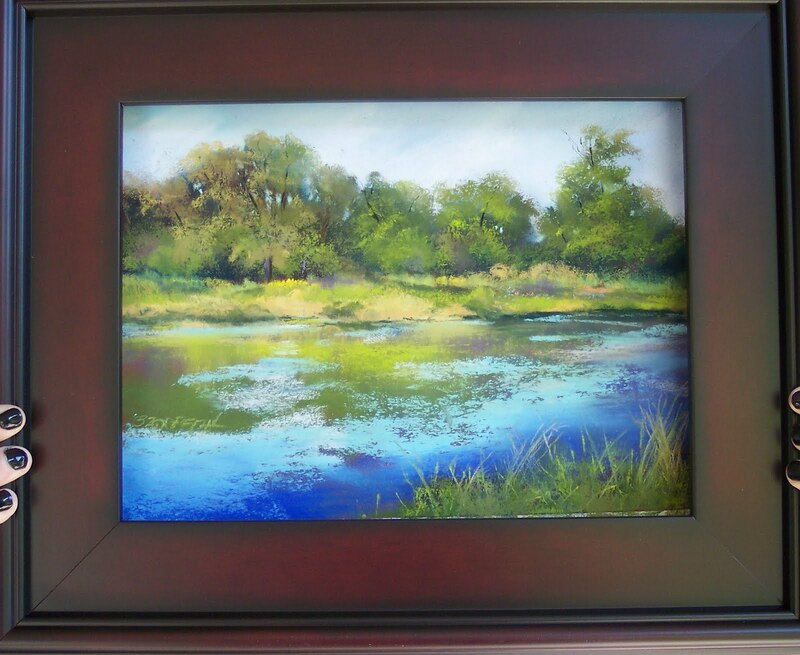 I have used the old pastel for an underpainting of a new one, first by getting rid of excess pigment and then wetting the surface with alcohol and using that as a colored base. Of course colors needs to be something compatible with what your new painting is…and that makes it work! I am getting ready to start working on some pieces for a show in Sandpoint, ID in November. It is an invitational show and will be at the Sandpoint Center where I showed for ArtWalk. 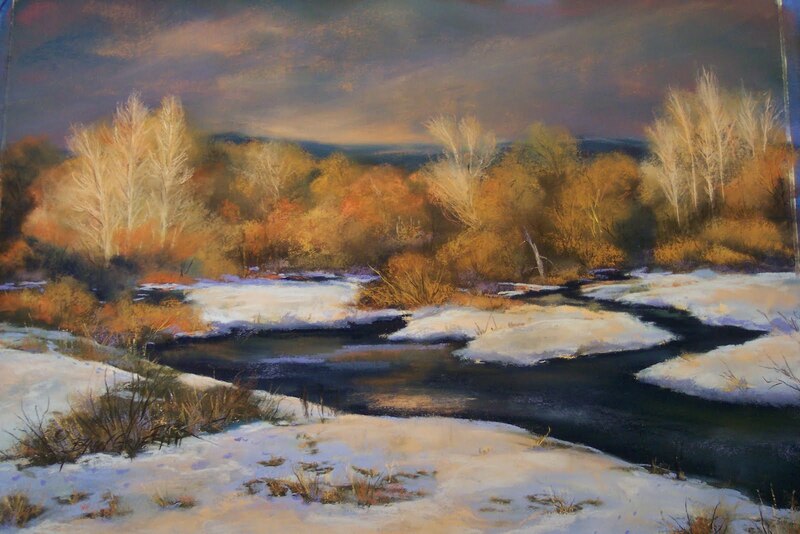 The criteria is that the work is to be landscapes of the northern ID. I have some great reference photos to start working with of that area. It is truly beautiful in that part of the world. There is lots of water and mountains. Color isn’t hard to find and it’s really an artist’s paradise. I am also working on pieces for September Walla Walla ArtWalk and I will be showing work at Williams Team Homes office. they have a wonderful office and good space for art. Chris has been working on another show space in MT that may come together in October as well. So I do believe that I need to keep painting!! It is good after having a major failure/melt down to have something come off the easel that you can feel ok about. I always challenge myself with water. It is one of those things that if I start to battle with it; nothing works. Waterfalls are fun and I have taken several reference photos of huge falls and small ones like this. The other challenge with something like this one is the rocks. 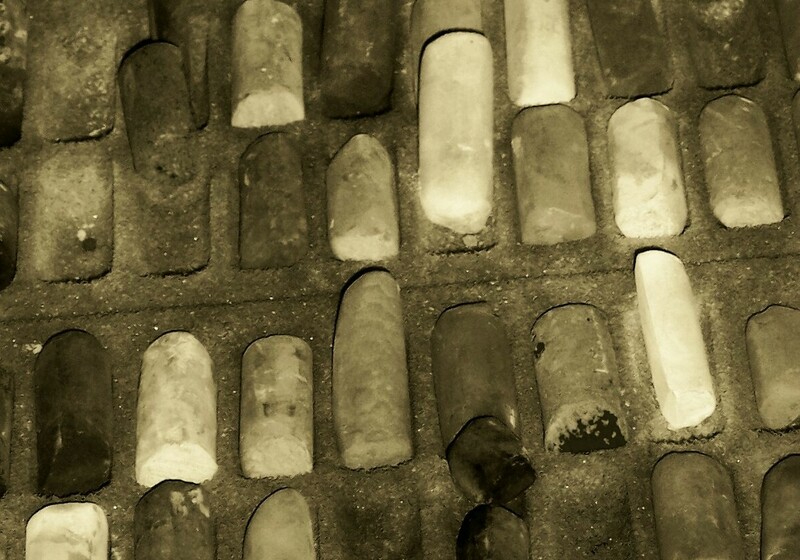 You can put a lot of different colors in rocks because there are! I finished some of these with a quick wisp of a metallic gold. I don’t think the photo does it justice; it makes them really come to life (if you can make a rock do that, that is!) and look dimensional. I posted “The Creek” on my Facebook “Like” page and my friend Idalee who is the best ballet instructor around says “where is that? I need to take my dancers there for a photo shoot.” Oh, oh…this one is basically in my brain – which is what I told her and said, I just didn’t think her dancers would all fit in there! I had gotten to inspiration (as I told her) from sitting in front of my daughter’s doctor’s office waiting for her to finish an appointment. It’s a newer southwest style architectural designed building with a nicely landscaped front including a pond, waterfall, rocks and vegetation. But I think there are places like this on the Walla Walla River and it’s tributaries or Blue Creek or Mill Creek and probably would have plenty of room for all the dancers!! I like to leave a painting hanging on the board for a few days after I deem it finished. Then keep giving it the eye every time I walk by it and make sure there is nothing I am dissatisfied with. It’s much easier to change something before it is matted and framed, than after the fact!. If there is some that I can’t put my finger on as to which about the work is not setting right, I will take it and hold it in front of a mirror and look at the image in the mirror. If there is a major problem, you will typically see it! It’s a 103 degrees and I gotta say, standing on the patio painting, it’s hot! That’s our weather – we can go from a balmy 75 to 105 overnight. That was yesterday. This morning at 0530 it is beautiful out, but we are headed for another hot day. I had some fun with some new pastels – Mungyo. They are a hard pastel and I bought this little tester set of half sticks – 60-ish colors. They are very similar to Nupastels. I used a sheet of Art Spectrum paper (Terracotta). Nearly all of this little painting was done with the Mungyo pastels. 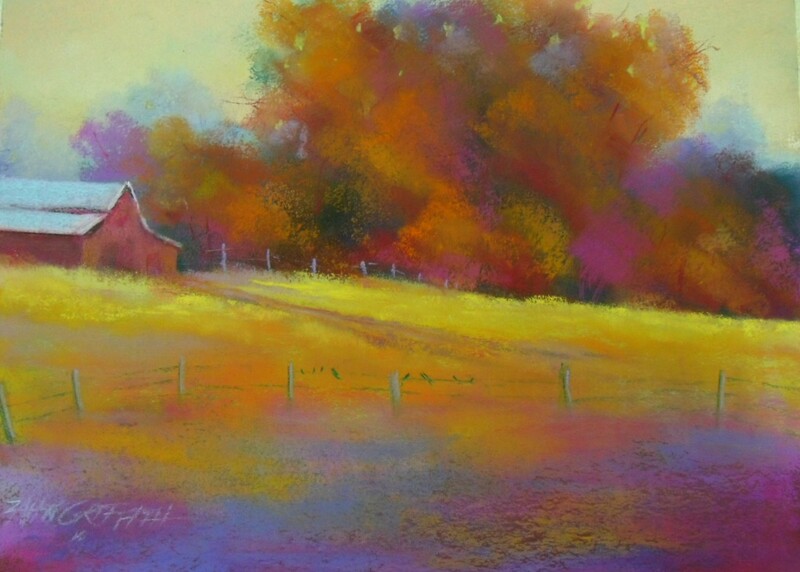 The colors are great and they work well into landscapes as I did with another piece. And they were quite inexpensive. 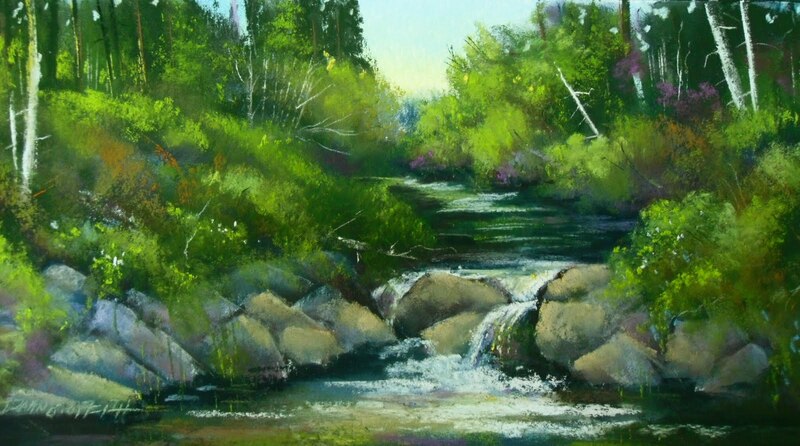 I am always intrigued with water and painting it – well. So there are times that it just works perfectly the way I want it and others…hmmm…my evil twin emerges and all is lost. 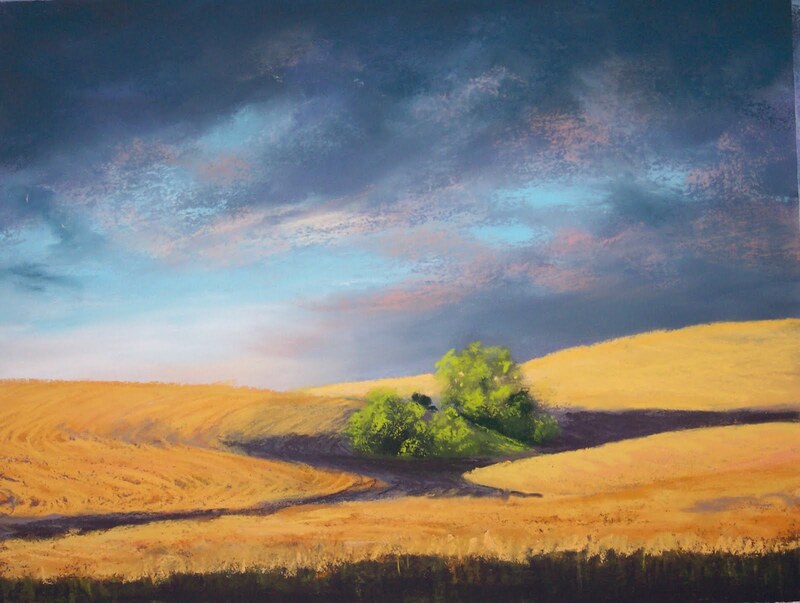 Same thing with wheat fields…because we are surrounded by wheat fields and vineyards, they have to be represented the way I want them…not much compromised. So this you might be able to tell is going to have a train wreck somewhere in this narrative. I had taken a reference photo of some fields with a road and sort of an edgy composition. Got the back ground sky, hills, trees, hint of a house and barn all in and it’s looking good. 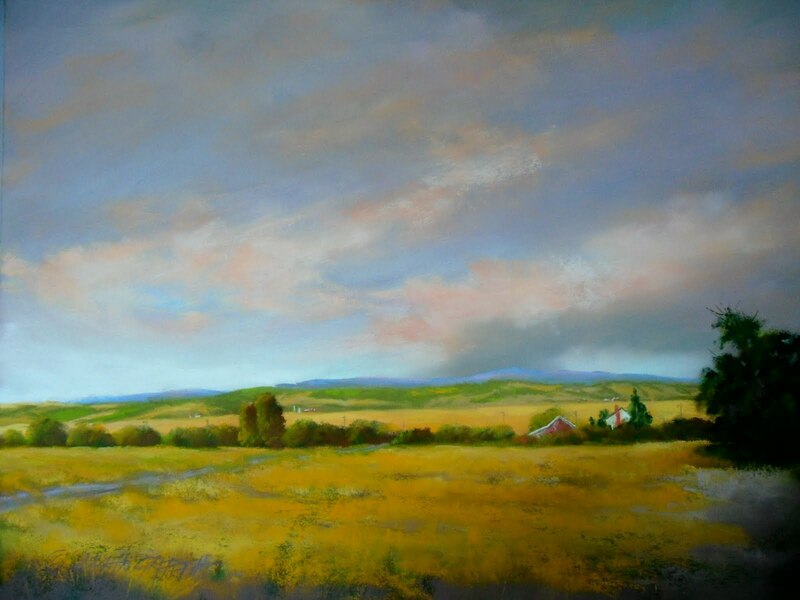 I have roughed in the road and fields with an under painting and started to work on the fields. Then I worked some more. And some more. I know what’s happening, but I could not stop working on this field and let me tell you it was going no where. I am working on Wallis paper; get rid of the attempts of wheat; start again. Yes ma’am, this is a train wreck. My husband came by; didn’t say a word. There you go….that spoke volumes! I know dang well this is a wreck and it’s fatal! Call it what you want; heat stroke, the emerging of my evil twin, a hissy fit, whatever…I gently untaped that paper from my board and folded it up, stuffed it all the way to the bottom of the garbage can and walked into the air conditioned house and sat down with a cup of coffee and watched a movie. I considered a couple of other paths like tearing that paper to shreds, then stuffing all the little pieces of paper in the garbage but that tends to make a big mess and the pastel dust is flying. The other option was to set fire to the paper and the easel or got the chain saw out and made kindling…but that might have not worked in my favor since I don’t always end up the victor with power tools and matches. I’ll just say that at our house we have several heavy duty power cords that are supposed to be 50′, but they are now about 46′. So a couple of days later I can look back on this episode of discarding a piece of Wallis paper loaded with a lot of pastel as another learning experience. When you know things are not going well…DON’T keep fighting the system. Step back and go watch a movie! And of course the next morning I am out digging in the garbage looking to see if there is something salvageable. And I guess I can say that it is not often that something goes so far awry that I need to destroy it! That’s the good thing! By the way…the painting of the water…it turned out. Today is a victory over yourself of yesterday. It’s all about taking one step at a time; always moving in a positive manner. You do what you have to do to stay on that path. And at the end of the day you can call it a victory…because it is. Yesterday morning I hit the floor about 0530 and packed my gear and headed over to a friend’s house and picked her up and we drove to a spot on her farm where this lovely pond lies in the middle of a grassy meadow surrounded by a creek and bunches of different types of trees to the south and a lush, soon to be harvested wheat field that stands about 3 feet tall to the north. The colors are brilliant. The pond is growing some algae at this time of year; exposed too bright sunlight and not a lot of rain to replenish the spring fed water supply. We were sort of lazy plein air painters, not hiking in a mile or two or more to a wonderful spot. We were able to drive to it; quickly set up and begin the process. It was nice and cool early on with a breeze, but as the time got be be mid morning, it was getting hot. Decided to pack it up about 11, but not before witnessing some wonderful sites such as a doe and two fawn meandering through the meadow, a bunch of wild turkeys foraging along the creek, wild geese eating in the pasture and taking off and flying west in formation, an osprey swooping down to the pond and catching a fish and then doubling back overhead like he was doing a fly-by, showing off his catch and heading to his nest. Great way to spend a few hours. The paintings on today’s blog were a result of those 5ish hours of work. I painted the vertical piece on a sheet of Art Spectrum black paper and the horizontal one on a rust coloured sheet. Even though they are toned, I soften the black one particularly with some Sennelier #463 for shadows. It gives a little more life to a summer scene. These are great papers to work with and hold pastel quite well. Another day we will go perhaps to the foothills of the Blues and paint and maybe to Bennington Lake area. On Saturday I met some folks who have a home in a vineyard toward Mill Creek. The view from their porch is incredible – overlooking a few wineries below them and to the west; to the east Mill Creek canyon; to the east and south the Blue Mountains in the background and across Mill Creek the foothills of Blues that are fields of soon to be harvested wheat and peas and the foreground of 5year old grape vines. The colors are wonderful…greens, golds, blues, reds. When you turn onto the lane that goes to their home you pass a tasting room for another vineyard…but the most spectacular thing is once you leave Mill Creek Road you turn onto this lane that is solidly lined on both sides with what appears to be 15 feet of lavender planted so that you get the sense of meandering up this lane of a solid wave of purple. It’s another painting! So with a great weekend of painting and photographing, it’s the beginning of a new week…A couple of new pieces will be going to Sandpoint for the POAC water show and pick up some pieces from the Art Walk I. Always be looking for something to paint; carry that camera with you so you have that reference photo!! 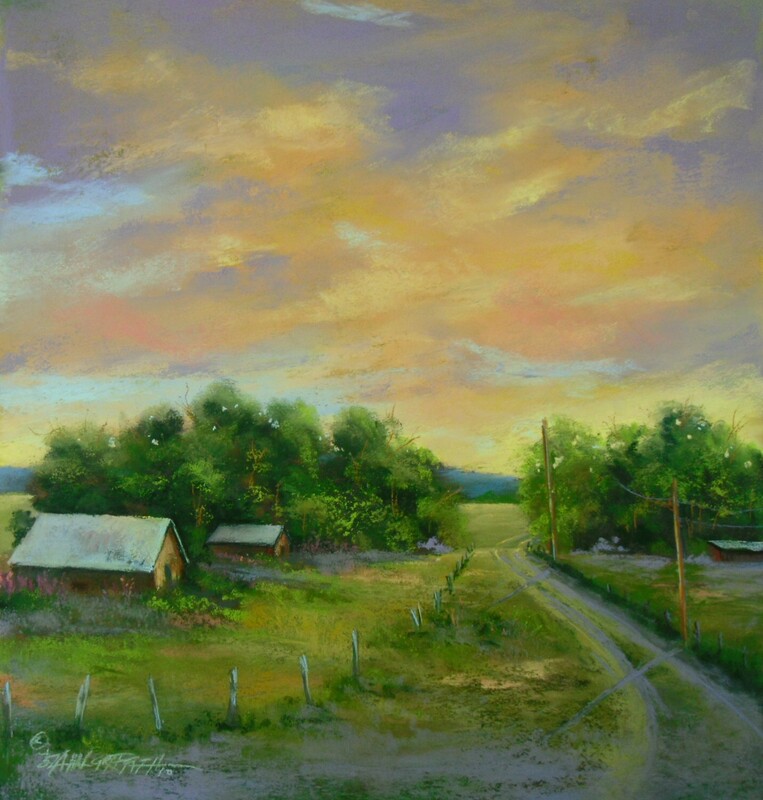 I love to paint skies – storm skies, evening skies, wispy cloud skies….they say a lot and and can mean different things to different people. When I was a kid, I liked to go out and lay down in the grass on a windy day and watch the clouds, ever changing, making cool formations as they moved with the currents of the air. Fortunately Where I lived you weren’t in danger or being run over or something while you were laying there in the grass day dreaming….guess that’s one of the perks to being a kid on some thousands of acres in the middle of Montana! Clouds are great. On my last trip to Montana, the skies were fabulous and I took a lot of reference photos of great skies. The skies in the three paintings today were two evening skies near Walla Walla. One evening as the sun was setting, there was this beautiful golden-pinkish glow. The large horizontal images above with the golden fields are pretty representational of that; however there is more of a pink tint to the actual paintings than is represented in the photo. 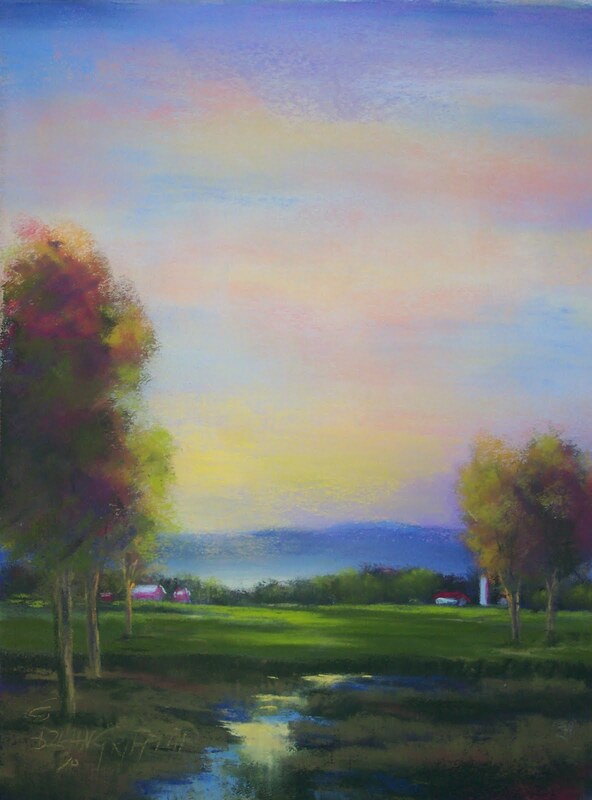 Regarding technique…I used the pastel boards from Art Spectrum for the fields with water and the hillside fields with trees in central part of painting. These are great to work with, have good tooth. I used the “elephant” colour boards….a nice purplish gray color. The other painting was done on a sanded paper from La Carte. I have not used this paper before, but it is very nice and it comes in a lot of great colors. I used an “earth” colored paper. I love Wallis, but this is great paper as well. I used a variety of pastels, but did hone in on several of the Diane Townsend earthy colors as well as Unison and some Schmincke. I love the Terrage’ sticks Diane Townsend has. They are big and gritty and are great to add that sparkle as last minute touch to a painting…and…there are some good bold colors that I like! Looking forward to a trip early to the farmer’s market in the morning, early – to beat the heat. Our weather has reached the 100 degree range now, so being outside midday and working in the heat is not the most pleasant, so it’s better to paint early and late in the day. But, that’s summer and I do enjoy it. I ordered some plein air frames for some paintings. Awaiting their arrival and am anxious to see how the pastels look in them. 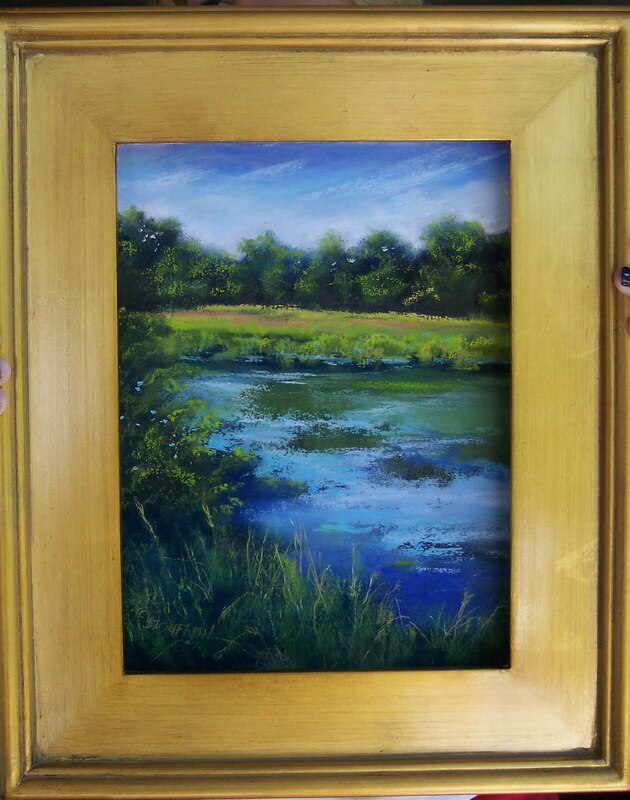 These are about 4 inch frames that have a deep enough rabbet to accommodate a spacer between the pastel and the glass. With this system, you don’t mat the painting. So the finished product has the look of an oil painting. It’s is a very classy look, so we will see how this goes. Even though the framing material is a little more expensive, there is not the expense of mat and because there is no mat the overall glass size is less, so that saves something. I will post some images of framed work once I get them completed. So in the meantime…happy painting and stay cool in the heat of the summer!! Hunting to win…what does that mean? Just something to get you to read this blog about entering competitions or not to enter competitions and jurying of art and such stuff. I am competitive. I like to win. I like to do things well enough to win. Seems like that has always been that way. I like to enter shows. I opt for a piece or pieces that I think are of good quality and maybe have a little edge on composition and interest; a piece that “speaks” to me. Once you do all the required things for submitting the entry you wait to hear…One thing of importance and this is speaking from working in an art center on the gallery committee and hanging shows…do what is asked in the guidelines – from the image submission to the hanger for the art. So then you wait and finally you get the notice – your piece is accepted. that’s great! If it wasn’t accepted…why? I think the first thing one needs to consider is that the if you have submitted a great quality painting and it didn’t get into the show it 1) did not catch the eye and the like of the juror 2) it didn’t fit what the juror was trying to say with his/her selection. One is not going to get every painting into every show. Maybe that juror was really partial to figurative painting, realistic and you paint abstract form…I usually check who the juror is and see what they do in their own world. I have passed up a few competitions just because I didn’t think my work would jury well and since there is a fee for jury process…it’s being somewhat sensible, I think. So if a piece is rejected, it may just mean it didn’t fit the bill for that show. I have a friend who does watercolors and does them well. She had tried for years to achieve signature status with her state’s watercolor society and could never get a piece to make that happen. Just one of those things that you can sit around and talk about over coffee. So, you don’t get accepted; not a reason for sorrow. Enter another show. When you do have a piece accepted, you’re happy and that is great…THEN if you get lucky enough to have really got the juror’s attention and they award you with one of the prizes for the show that’s the ICING ON THE CAKE!! I have entered the same piece in different shows; winning the best of show at one; an honorable mention at another and not making the juror’s cut in another. So what’s it all mean…the jurying process is an opinion of one person. Not being accepted or not winning a prize is not the end of the world or reason to feel rejection. Recently someone said they would not want to physically go to a show that they had a piece accepted in and be there when the juror announces the winners and then not be one of the winners. WHAT??? Be proud that you had a piece accepted; go and enjoy the other art and study what won! You might learn something…and it might be just that your style wasn’t what the juror picked for winning pieces. Sometimes just being there is (should be) enough! And there are jurors that I have heard say and then choose work for shock factor…that’s sad, I think. But just like the juror’s are but one opinion; these are my takes on entering shows. I enter because I like to see if my work will be accepted and just to get accepted into some of the higher end shows is really enough. Think I have learned some humility over the past 50 years!!! Where do I come in at? Just glad to be here!